Use Project Configurator to create a new, empty gem. Navigate to the lumberyard_version\dev\Tools\LmbrSetup\Win\ directory and then start ProjectConfigurator. Select the project and click Enable Gems. Click Create a new Gem on the gems page for the game project that you selected. For Name, enter a name for the gem (for example, MyNewGem). The name must start with a letter, and only alphanumeric characters and underscore are allowed for the rest of the name. Other special characters or spaces are not allowed in the name. (Optional) For Summary, enter a description for the gem. For Type, select Code & Assets or Assets Only. Code & Assets – Contains assets as well as code that performs certain functions upon the assets. Assets Only – Contains only assets and no code. Assets – Directory of assets for your gem, such as materials, models, textures, and audio files. 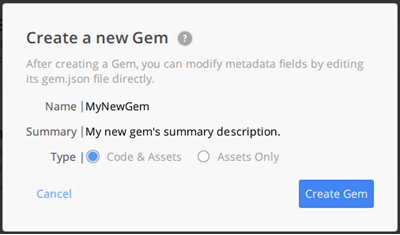 The AZ::IO system automatically includes this directory so that you can reference assets provided by your gem. For example, if you have a material file, \Assets\materials\MyMaterial.mtl, you can reference it in your code with the path materials\MyMaterial.mtl. If this directory is not present, you can manually add it. If you don't have any assets in your gem, you can remove this folder. Version – n.n.n (numerical values only). Gem revision is not supported, so you should not plan to increment the revision after shipping the gem. DisplayName – Friendly display name. Can contain spaces. Tags – Searchable tags that are displayed in Project Configurator under the gem's summary. Enter this as a comma-separated list of strings. IconPath – Path to the gem's display icon. Dependencies – You can specify a dependency on another gem or on an engine version. Edit the _comment metadata. preview.png – Preview image displayed in the Project Configurator gem’s list. Code\gem_name.waf_files – Waf files json for your gem that specifies which files are built, how files should be combined into uber files, and how files are filtered in the Visual Studio Project. Code\gem_name_test.waf_files – Additional files to include when building with the test specification. Code\wscript – Waf wscript Python file that defines libraries and other build settings used by your gem. Code\Include\gem_name\gem_name_Bus.h – Globally visible header that can be included by any project that uses your gem, or by other gems that depend on it. External code can call into your gem's module and receive events from your module through public event buses. Event buses allow simple and safe function calls between different modules of code. Code\Source\gem_nameModule.cpp – Implementation of the gem_nameModule. Starting in Lumberyard 1.5, new gems are built around AZ modules. The default module registers one system component, the gem_nameSystemComponent. Code\Source\gem_nameSystemComponent.h – Header for the gem_nameSystemComponent implementation. This component is registered by the gem_nameModule and is a handler for the gem_nameBus. Code\Source\gem_nameSystemComponent.cpp – gem_nameSystemComponent implementation. Inside this component are the typical Activate, Deactivate, Init, and Reflect methods. 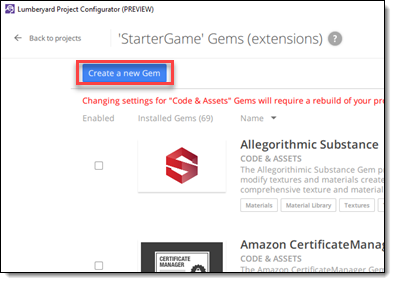 If your gem is a Code & Assets gem, you must build your project. If your gem is an Assets Only gem, you do not need to build your project.